With renewed pledges to transition its economy and defend free and fair trade, China has reasserted its role as an anchor of growth and globalization in front of world's political and business leaders who assembled here to draw a blueprint for an inclusive future. From Tuesday to Thursday, around 1,500 politicians, officials, entrepreneurs, scholars and media representatives from over 90 countries and regions will discuss topics from inclusive growth to the new industrial revolution at the Annual Meeting of the New Champions 2017, also called Summer Davos. Established by the World Economic Forum (WEF) in 2007, the summer forum is held each year in China, alternating between the port cities of Dalian and Tianjin. With the quickest GDP increase for 18 months in Q1, China is making efforts needed to put flagging global growth back on track. "China's growth is an incredible contribution to the global economy," said Klaus Schwab, the WEF founder and executive chairman. China has been a major stabilizer and driving force for the world economy, contributing more than 30 percent of recent growth. GDP in Q1 grew 6.9 percent year on year from the same period in 2016. Addressing the opening of the gathering, Chinese Premier Li Keqiang said the economy has become more stable and sustainable through steady transformation. China took neither strong stimulus measures nor followed the old investment-driven, resources-reliant path, but strived to innovate and reform in its economic shift to consumption and service industry, Li said. Official data showed that consumption contributed 64.6 percent of GDP in 2016, while the tertiary sector accounted for 51.6 percent. From bike sharing to mobile payments to e-commerce, China's nascent emerging sectors and enthusiasm for innovation are underpinning inclusive growth. New momentum, including new industries and new business models, contributed around 70 percent of all new urban jobs last year, said the premier. "China is undoubtedly the leader in the sharing economy, which injects new vitality into the broader growth and helps reforms," said Ge Hong, Airbnb's vice president. The home-sharing company remains upbeat about the Chinese market and economy with plans to increase its presence this year. Summer Davos has been held in China for a decade and shows China is no longer an economy based on manufacturing but has great potential to move very fast into the era of the fourth industrial revolution, Schwab said. China will continue to maintain medium-high growth with its huge market potential and creativity from a population of over 1.3 billion, the premier said. In the short term, the premier believes the economy is resilient and this years' growth target (around 6.5 percent) is attainable. Financial institutions, including the International Monetary Fund, have upgraded their forecast for China, encouraged by new impetus and progress in economic re-balancing. Li Daokui, an economist with Tsinghua University, is optimistic, predicting growth will accelerate in 2018 with rising private investment and improved government efficiency. As protectionism rises, the forum in Dalian is an opportunity for inspiration. 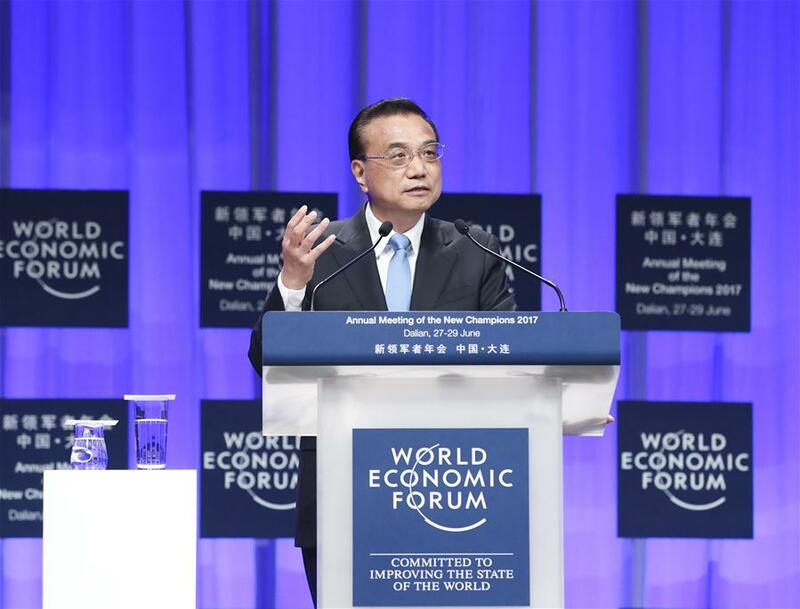 Countries must safeguard economic globalization to achieve inclusive growth, Premier Li said in his speech. Globalization means the free flow of merchandise, capital and human resources, creating a bigger market and more choice for consumers that benefit all countries, he said. The problems facing different countries are not due to globalization itself, but because of their inability to address it, he noted. "It does not make sense to blame a rough road and stop moving if I sprain my ankle." Defending the authority and effectiveness of multilateralism, the premier said no country should impose unilateral rules on others, or politicize fair trade. David Wu, senior partner of PwC China's Beijing branch, pointed to China as a staunch defender of economic globalization. Inclusive growth that China has been championing is an effective solution to the difficulties facing globalization and the world economy, Wu told Xinhua after the opening ceremony. China will expand market access in the service and manufacturing sectors, relax restrictions on foreign ownership, and treat Chinese and foreign companies on an equal basis, Premier Li said. To make it easier for foreigners to set up enterprises, in some cities Chinese and foreign companies already go through registration procedures at the same window, Li said. "All companies that are registered in China will be eligible to enjoy the same supportive policies which China makes, in accordance with WTO rules, to push forward the 'Made in China 2025' strategy and promote innovation," he said. Wu said companies of all countries could share the opportunities provided by the Chinese economy. Foreign companies are encouraged to use profits from the Chinese market to reinvest in China, or they can take their profits out of China without any restrictions, he said.